You may choose any or all of our fresh veggies on your giant sub and specify whether you want condiments on the sandwich or on the side. Cheese is included, while bacon can be added for an additional charge. 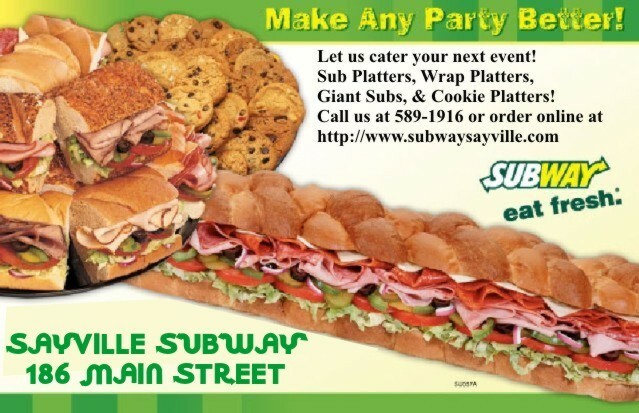 All SAYVILLE SUBWAY sandwich platters are prepared with your choice of bread and toppings. Choose any combination of our cold sandwich selections. Napkins and our assortment of SUBWAY sauces, mayonnaise and mustard is supplied with each Giant Sub and Platter. Sandwich Platter serves 5-9 15 pcs. Flatbread Platter serves 5-9 16 pcs.